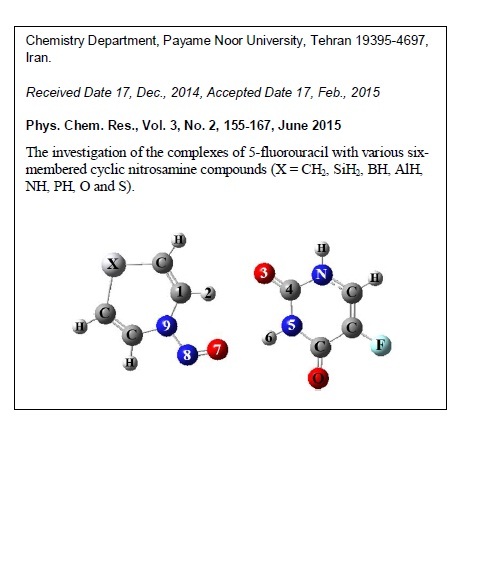 We present detailed theoretical studies of the H-bonded complexes formed from interaction between 5-fluorouracil and various six-membered cyclic nitrosamine compounds. 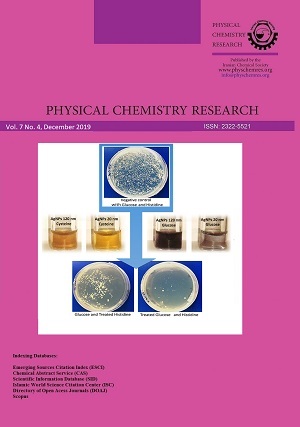 In this study, an investigation on intermolecular interactions in X-NU (X = CH2, SiH2,BH, AlH, NH, PH, O and S) complexes is carried out using density functional theory. The calculations are conducted on B3LYP/6-311++‏‏G** level of theory for optimization of geometries of complexes and monomers. Furthermore, quantum theory of ‘‘Atoms in Molecules’’ (AIM) and natural bond orbital (NBO) method are applied to analyze the H-bond interactions in respective complexes. The electron density (ρ) and Laplacian (s2ρ) properties, estimated by AIM calculations, indicate that O…H bonds possess low ρ and positive s2ρ values which are in agreement with electrostatic character of the H-bonds. In addition, the examination of the H-bond in these complexes by quantum theory of NBO method supports the obtained results. Natural population analysis data, electron density, and Laplacian properties, as well as, the ʋ(C-H) and ʋ(N-H) frequencies of complexes, calculated at the B3LYP/6-311++‏‏G** level of theory, are used to evaluate the H-bond interactions. Several correlations between topological, geometrical and energetic parameters are also found.